Some things are for "grown ups only"! This book is one of those things. The allusions used in these exercises refer to a historical scope of philosophical and literary reading, TV shows, movies, songs, and personalities. Double entendres and plain ole puns sprinkle the exercises. And the exercises are mini-stories of characters who inhabit most colleges, universities, and small towns . . . though not in so extreme forms. These are the activities of active adult minds which enjoy playing while working. Welcome to Adult Literacy in Writing. 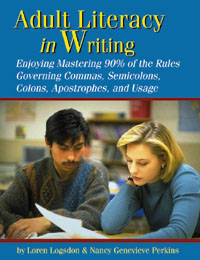 While many handbooks and workbooks are available for you to study punctuation and usage, they often assume that a student wants and needs to have every rule and every exception explained. This book was written because as vintage teachers we believe that before a student studies all the rules that a few basic rules are essential. This book will provide you with those basic rules. Some things are for "grown ups only"! This book is one of those things. The allusions used in these exercises refer to a historical scope of philosophical and literary reading, TV shows, movies, songs, and personalities. Double entendres and plain ole puns sprinkle the exercises. And the exercises are mini-stories of characters who inhabit most colleges, universities, and small townsÑthough not in so extreme forms. These are the activities of active adult minds which enjoy playing while working. Two types of information will help you acquire this knowledge. First, a brief explanation of the concept will be given. Second, multiple exercises with their answers are available so that you may practice the concept. Each chapter builds, or scaffolds, on the previous chapter's information. It is not necessary that you do all of the exercises in each chapter before proceeding to the next chapter. Once you are secure in your knowledge governing each chapter's concept and are making very few errors applying it, go on to the next chapter. If in a later chapter you should realize that you don't really have a firm command of some earlier material, then go back to that material and do additional exercises or reread the material. We hope you will enjoy your learning experience in Adult Literacy in Writing! We feel confident you will learn a great deal toward mastering the English language.